On the evening of May 6, 2017, Brooklyn’s Barclays Center was filled to capacity and humming. 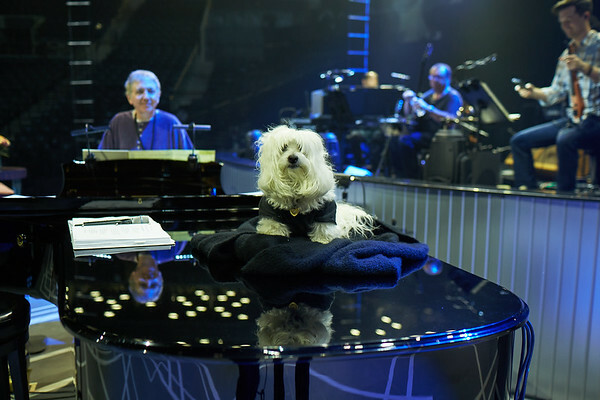 Tickets for Barbra’s highly-anticipated concert sold out weeks in advance, yet by 8:10 p.m., two sixth-row seats remained conspicuously empty. If you had floor seats or binoculars, it was a good night for stargazing. Donna Karan, Barry Diller, John McEnroe and his wife, singer Patty Smyth, Ted Danson, Mary Steenburgen, Josh Brolin with his wife, Kathryn, Jim Brolin, Sigourney Weaver, Linda Lavin, Mark Sendroff, Lee Brian Schrager, Gio Benitez, Tommy DiDario, Denise Richardson, Dr. Oz, Michelle Williams, Neil Patrick Harris, David Burtka, NYC Mayor David Dinkins, House Representative Charles Rangel, Ben Stiller and other glitterati and politicos all made the trek to Brooklyn. And then they appeared, emerging from a darkened corridor near the side of the stage. Her custom-tailored pink power jacket and his close-cut silver-grey hair were the first giveaways, as emblematic as Michael’s sequined glove or Frank’s fedora. As news of their arrival spread, the audience rose to their feet en masse — ecstatic, cheering, swaying iPhones above their heads, snapping away, hoping the subjects of their adulation would step into frame. Countless blurry photos went careening through cyberspace, making their way onto Facebook, Twitter, Snapchat and Instagram. At 8:20 p.m. an announcement reverberated through the hall. “Ladies and gentlemen, please take your seats…the show is about to begin.” And with that, the lights suddenly dimmed and the focus was magnetically drawn to the stage, where the audience was treated to a visual time capsule — vintage performance clips of Barbra in-concert through the years, from the Bon Soir to Barclays Center. When the tympani drum triumphantly punctuated the final three chords of “People,” the giant video wall parted and there she was — regal, radiant and ready. Barbra appeared genuinely overwhelmed by the gale-force that greeted her entrance. 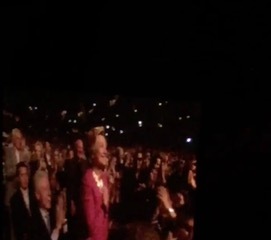 It was the first of many standing ovations the audience would give her throughout the evening. Drawing in a deep breath and finding her emotional center of gravity, she quietly said, “This is what the evening’s all about.” Those few words were the crowd’s cue to decrescendo to a respectful hush. When she began humming the instantly recognizable intro to “The Way We Were,” her tone was sweet, comforting and in perfect pitch. 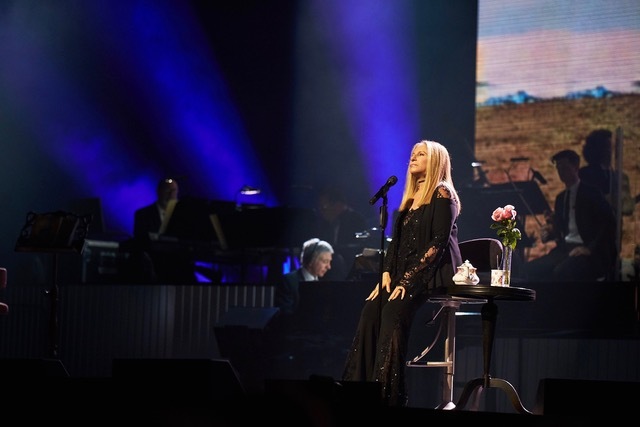 The hum then melted into the single defining phrase of the song, “Mem’ries, light the corners of my mind,” and our encore journey with Barbra had officially begun. When the song ended, another ovation…but now Barbra had something to say. She explained that although she had many friends and colleagues in the audience, she wasn’t going to single them out, because whenever that happened to her, she always found it embarrassing. 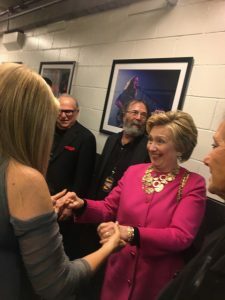 However, as the evening was all about “memories,” she wanted to share a very special one, and proceeded to tell us of a promise she’d made more than two decades earlier to then presidential candidate, Bill Clinton. In 1993, she told him that if he won the election, she would be honored to sing at his inauguration. As we know, that’s exactly what happened. Now, tonight, she was once again honored to welcome the great 42nd President of the United States, William Jefferson Clinton, to her concert. When she said his name, the proverbial needle zoomed past “10” on the Applause-O-Meter! After the clapping subsided, it was time for some remedial education. 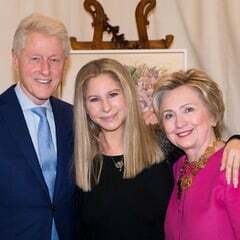 “Professor Barbra Joan Streisand” reminded her “students of Barclays U” of some salient facts…or as she playfully advised, “real facts” about just a few of President Clinton’s many accomplishments. “He lowered taxes for the poor, raised taxes on the rich…and speaking of taxes, he’d actually showed us his tax returns! !” The audience responded with an ear-splitting howl of agreement. The 2017 Nassau and Brooklyn shows were built on the same foundation as her 14 previous shows in 2016. 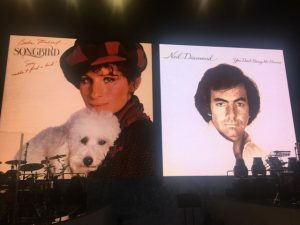 Once again, Act I featured songs and record sleeves spotlighting her ten #1 albums over six decades, and Act II covered selections from what became her eleventh #1, 2016’s Encore, with other personal favorites from different eras of her storied career. As every attentive fan knows however, no two Streisand concerts are the same. She doesn’t even know the meaning of “phoning it in”– nothing is canned. 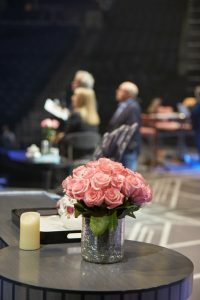 Inevitably, several new elements found their way into these final shows, including an achingly beautiful solo rendition of Stephen Sondheim’s “Loving You” from his 1994 Broadway musical, Passion. As an avid theatergoer, Barbra knew the song from the original show, but she really fell in love with it when she heard Johnny Mathis’ version from his album, Mathis On Broadway (2000), arranged by Jonathan Tunick and produced by Richard Jay-Alexander and yours truly. 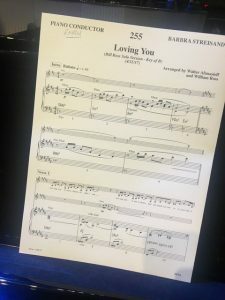 Barbra initially recorded a solo version of the song for Encore, but when the album was transformed into a duets project, she had Tunick’s “Loving You” arrangement adapted and expanded by Bill Ross and Walter Afanasieff for her sublime pairing with Patrick Wilson. A little less than two weeks prior to the show, Barbra had lost one of her close friends, talent manager Sandy Gallin. Sandy, who happened to be born and raised in Brooklyn, was not only well-known in Hollywood, he later became a very successful designer of elegant homes that he bought, refurbished and sold, often to the many friends he’d made throughout his lengthy career. Barbra loved his zest for life and was deeply saddened by his passing. She eloquently expressed her feelings by singing “Everything Must Change” from Higher Ground. Upon its release in 1997, Barbra had dedicated the album to President Clinton’s late mother, Virginia Clinton Kelley. When she learned the President was attending this Barclays concert, she decided to dedicate the song to both Sandy and Virginia. 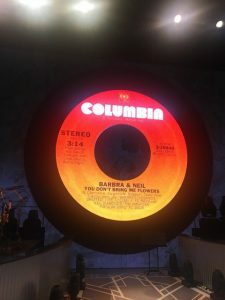 Then Barbra invited the audience to sing along to the optimistic chorus of “Happy Days Are Here Again,” and when they did, she harmonized along with them. Even the Clintons joined in! When she is on stage singing, I usually sit toward the back of the arena, next to the sound booth. It’s a given that I’m one of the most technically challenged people you’ll ever meet. In fact, I couldn’t even tell you where the on/off switch is on my own audio equipment. But I have ears! So every once in a while, if I feel like the background vocals are being drowned out by the drums, or I want to hear more orchestra or less guitar, I glance over to Barbra’s longtime soundman, Chris Carlton, pretend to play air-violin or air-drums, or point my finger up for “louder,” or hollow my hands together to indicate the hall is too “boom-y” sounding, and Chris instantly nods and makes the appropriate adjustment. It is so great working with people who can understand your special sign language! Everyone on the team happily knows that nothing is set in stone…so spur of the moment changes may be needed…and guys like Chris or our lighting director Peter Morse always deliver without fail. But the one person who automatically makes it new and exciting each time is Barbra herself. To keep her oft-repeated greatest hits fresh, she’ll unexpectedly bend certain notes, or phrase a lyric with new emphasis in ways that surprise both the audience and herself. A small illustration of this: One of the first songs she ever turned into a classic was “People” from the Broadway musical, Funny Girl. 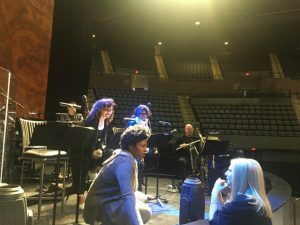 Since 1964, it has been a staple on no less than a dozen of her albums, including the Funny Girl Broadway Cast and Motion Picture Soundtrack versions, various other studio recordings, and several live in-concert releases. Depending on the nature of the show she’s performing – grand scale arena or smaller, private charity event — or wherever the song happens to fall in the set list, or if the subtleties of the arrangement vary, Barbra will sing the very last lines of the song (“People who need people…are the luckiest people in the world”) with a distinctive weight placed on each word. Check out all of these recordings and listen for yourself! Her interpretations aren’t premeditated or suggested by a record producer, or just different for the sake of being different. They are musical expressions from her soul — and evidence of an artistic genius at work. The length of each note she holds or bends, or whether she sings the word “luckiest” or speaks it, is the result of how she’s feeling it, in the moment. For the Brooklyn show, Richard, Nellie (our Script Supervisor) and I arrived at the venue at 1 p.m. and grabbed a quick lunch from the outstanding catering service staff. (I should mention, The Music…The Mem’ries…The Magic! could have easily been subtitled the “I Can’t Magically Lose Any Weight On This Concert Tour”). There was little time for that second helping of pie because our iPhones were already buzzing with new messages from Barbra. From the moment she awakes, goes through her morning routines, has breakfast, dresses, and heads towards the arena, she’s thinking about the evening’s concert. We receive a flurry of small revisions – “Change ‘hope’ to strong belief,” “Cut two bars from ‘Loving You,’” “Page 17 note must intro backup singers,” “Pls. remind me…where do we thank Columbia Records?” – question after question, comment after comment. And when she arrives, we discuss all these options and whatever decisions she makes are rehearsed and become the final show — for THAT night! A quick Google search will inform readers how the critics felt about these two concerts and the 14 that preceded them. 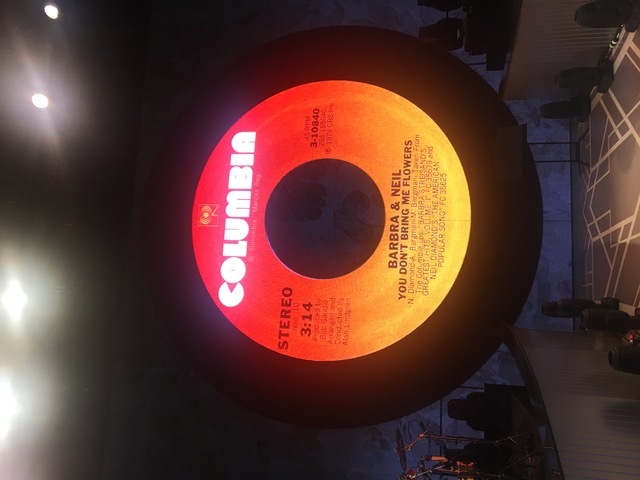 They listed the songs, recapped the jokes, described the audience’s reaction to the political commentary, and of course, evaluated Barbra’s overall performance. Every paper in every city used every superlative in the book! Just like with the first set of concerts, the reviews for Nassau and Brooklyn were home-run-out-of-the-ballpark raves! As a brief aside, here’s what I think about reviews, whether the overall takeaway is negative or positive. If a professional critic has a genuine understanding of an artist’s history and an appreciation about what he or she is trying to accomplish at that given moment in their career, then the artist and/or their creative team can actually learn something from both the great reviews as well as the less than enthusiastic ones. What I especially appreciated about all the reviews relating to this mini-tour (beside the fact that they were uniformly rapturous!) is that they sometimes helped validate an idea we perhaps weren’t 100% sure about. After all, putting a show together isn’t a science; it is based on instinct. 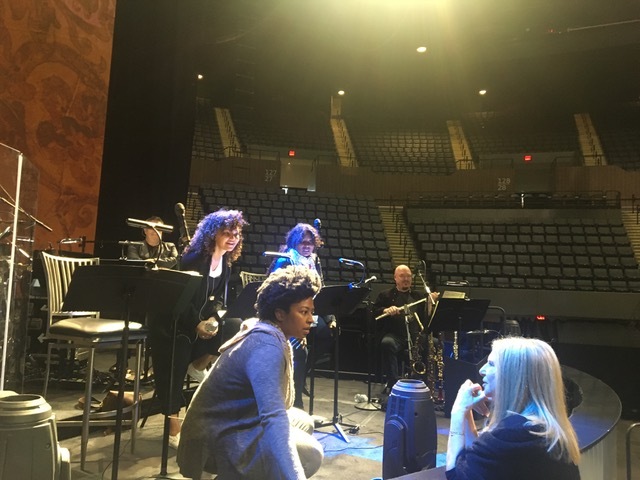 I’ve learned through the feedback I’ve received from writing this blog and keeping these tour diary notes that readers like to hear a bit about Barbra’s creative process, her reasons for selecting certain kinds of songs, how she thinks about presenting them visually, and how she wants the dialogue that introduces a particular song to be just so, in order to put the lyrics into context. 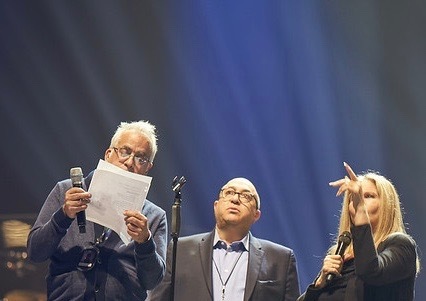 The great songwriter Sammy Cahn was frequently asked by admirers of his music, “Which comes first Sammy, the words or the music?” His standard response was, “The phone call.” And such has been true of every new Barbra concert or album I’ve participated in for almost three decades. 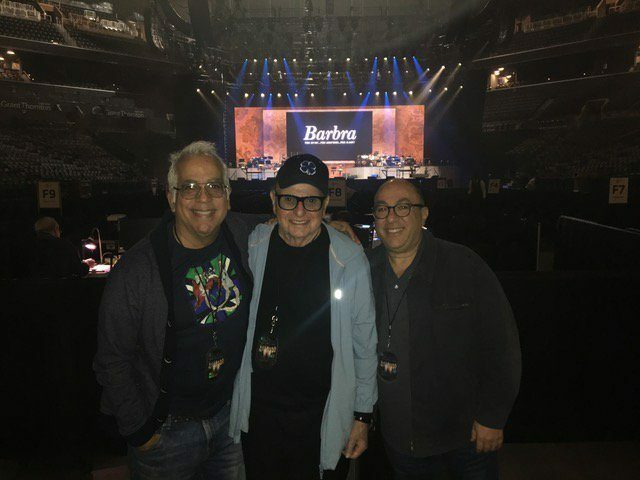 In this case, sometime in mid-January, Marty Erlichman called Richard Jay-Alexander and me to inform us that Barbra had agreed to perform two shows in New York sometime in early May. It would also coincide with her TRIBECA TALKS appearance and discussion about directing and her career, with filmmaker Robert Rodriguez. 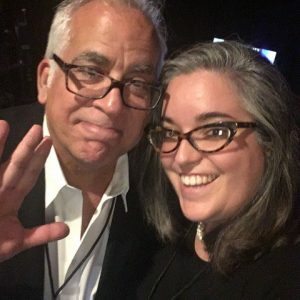 Marty was still negotiating the exact days and other details, but generally speaking, it would be a continuation of the same Music…Mem’ries…Magic! concert tour. Therefore, we should think about what kind of revisions might be required – subtractions or additions to keep the show fresh in terms of repertoire and script. We all kept in touch for the next several weeks, reviewing scripts from the past shows and comparing notes regarding dialogue that could be edited, clarified, replaced or dispensed with altogether. During this time, Barbra had been editing an upcoming Netflix special of the concert filmed before the Christmas holidays in Miami, so she already had some edits and ideas in mind. Then Richard flew to L.A. on Easter Sunday, April 16th. We met at my house on the 17th to review everything we’d present to Barbra the following day. Since we had most of the basic set list already selected from the previous shows, much of our energy was spent revisiting the dialogue. As one might imagine, Barbra has a voracious appetite for news, particularly about politics! Since the last round of concerts, the mood of the country had dramatically changed. In the pre-election season, it was easy to lampoon the foibles of the Republican candidate. Now things had taken a severe turn, and what had once seemed almost preposterous had now become, at least in our estimation, surreal. It had to be addressed. But how? Without asking, we knew Barbra would want to express her feelings candidly but not in an off-putting way. Especially where current events were concerned, our job as “co-writers” was simply to act as a sounding board for her many ideas. During one of our sessions, we jokingly told her that “Everyone should be entitled to YOUR opinion!” She responded, “I know that sounds funny to say, but we can’t forget a lot of people have gone to great lengths to get these tickets…they deserve to be entertained.” So, we volleyed back and forth, figuring out the best ways she could state her opinions, but somehow lace them with humor – either gentle or jagged but never hectoring. Barbra would free associate and if we all laughed at something she said or were moved by a particular insight, we would point at her and say something like, “Keep going!” or “That’s it!” Then we each feverishly jotted notes to try and capture what she’d said, maybe modifying a word here or there. We then examined each statement with a magnifying glass to make sure it conveyed exactly what she wanted to express, with accuracy, clarity, bulletproof reasoning…wasn’t too long-winded and stayed on point…basically every variable we could think of. At the end of the process, every idea sprang from something Barbra had either said, written down or taped into her iPhone late at night. We’d collect her many thoughts, shape them together, and then either Richard or I would read Barbra’s own dialogue back to her. If she thought a word sounded too fancy, she’d say, “I don’t speak like that!” and find a more direct way of saying it. On many occasions, I’ve told Barbra, with tongue only slightly in-cheek, that if she ever decided to switch careers, she should seriously consider becoming a book editor. Besides being an outstanding writer, she has a superb ear for what sounds “real” vs. “written.” Once she’s happy with where the content is headed and the rhythm of the dialogue, then her superb comedic timing or dramatic interpretation of a line takes over. One of Richard’s and my private joys is that if we come up with a line reading that we think is close to the way Barbra might deliver it, although neither of us can precisely imitate her tone or phrasing, we can both somehow hear her in our inner ears. Without fail, she elevates what’s on the written page and vividly brings those words to life. When that happens, we look at each other, smile and nod. For example, even before we set pen to paper or discussed a single song idea for the original 10 dates, Marty had suggested to Barbra, me and Richard that the show should celebrate her latest career achievement of earning ten #1 albums over six decades. It was a feat unlikely, if not impossible, to ever be surpassed by any other artist in our lifetime. He felt it would give a focus to the show itself, not to mention the advertising campaign. That notion eventually lead us to come up with the title, The Music…The Mem’ries…The Magic… (Note: “Mem’ries” was intentionally spelled with an apostrophe as a tip of the cap to lyricists Alan & Marilyn Bergman’s spelling in the official sheet music of “The Way We Were.”) When Barbra saw the first mock-up of the tour poster, she replaced the ellipsis (three dots) after “Magic” with an exclamation point, because it struck her as more aesthetically balanced and made the word “Magic,” well, more magical! Also, the poster and advertising art showed images of Barbra through each of those six decades. For those who are not privy to the actual nuts and bolts of mounting a show of this magnitude in venues across the country, there are many physical, logistical, technical and financial considerations that are always in play. Without burdening you with too many details, first, consider that no two venues are alike. Even if you play in the same arena on let’s say a Monday and Wednesday night, they might have a hockey game on Tuesday night with an entirely different seating configuration, not to mention different sound, lights, merchandise for sale in the lobby…and a floor of ice!! In many ways, it’s actually easier to produce a long-running tour, in multiple cities, where the artist sticks to a pre-selected set list and performs at least once every other night for months on end. Let’s call this the Bruce Springsteen model. The Boss goes out on tour as “briefly” as three months or as long as a year or more. His crew becomes a well-oiled machine. 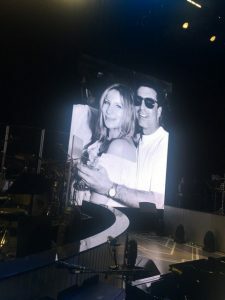 A different example: For extended stretches of time during the past decade, Celine Dion has performed nightly in an exclusive residency at Caesars Palace in Las Vegas. Her fans come from around the world to see her. She sings with intense passion each night, but her set doesn’t need to be constructed and deconstructed on a daily basis, re-lit for each new venue, packed into giant trunks and cases, then loaded into semi-trucks and driven in the middle of the night, in shifts, to the next city. She also doesn’t need to engage large support teams of traveling riggers, gaffers, electricians, sound and lighting crews, security teams, hair, make-up and wardrobe artists, catering staff, personal assistants, musicians and the technical crews that keep the instruments in tune and in working order. In other words, it takes the same amount of people to produce one concert or 100 concerts, only the economy of scale changes. If you look at the credits page in one of Barbra’s tour programs, you can see just how many people it really takes to build the A-Teams who operate a show from the start of rehearsals through the run of the tour. Truer words were never spoken when Hillary once said, “It takes a village.” These “road warriors” are always in high-demand and basically live out of their suitcases, working with artists who are continuously on tour. It’s such a comforting feeling knowing that, even after months apart, you can walk onto a stage in a new arena, and it feels as familiar as your own living room. When Barbra arrives for her sound check, she doesn’t have to reorient herself, she’s already “home.” This is really a testament to the tireless road crew and tour managers like Marty Hom, Michael Weiss and JJ Erlichman, who keep the trains running on time. 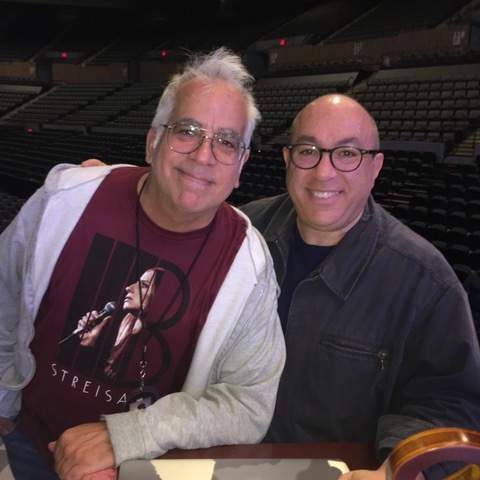 To put a fine point on it, for someone like Richard Jay-Alexander, who co-directs the concerts with Barbra, he must rely on all of these department heads to do their jobs, in order for him to effectively do his. If the video wall doesn’t open at precisely the right moment, or the film clips don’t start on cue, or the spotlight doesn’t fade or iris at the end of a particular song, or any of a thousand and one variables go even slightly awry, then the timing or look or feel of the show is potentially compromised. Of course, part of the thrill of attending live performances by great artists is witnessing their adaptability to carry on when unforeseen mishaps occur, as they always do! Even if Barbra sees or hears something amiss, she powers through. In showbiz parlance, she’s a total pro! Therefore, it’s really a credit to Richard and the steady heads and hands of his technical crew that these two shows, in Nassau and Brooklyn, were as seamless as they turned out to be; and to Marty, who kept tabs on and ultimately hired much of Barbra’s tried-and-true team, who quite literally were all working on different tours across the globe. And it also must be noted that for Barbra, an artist who often speaks about wanting to be “in control,” it took a lot of courage to place herself under those white-hot spotlights once again, striving for excellence, but without her usual prep time. So here we are at the official end of the tour. 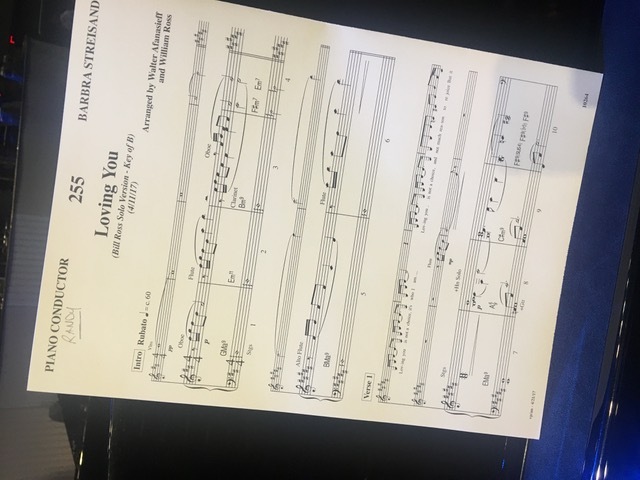 It has been quite a thrilling adventure…and these tour notes have allowed me to not only relive the highlights of each show, but also to hopefully give you a clearer picture of why Barbra is such a totally unique artist. She is in many ways the living embodiment of what is sometimes described as “the virtuous circle.” Her multitude of interests and skills — including art, architecture, horticulture, politics, design, photography, social advocacy, medicine, movies, theater, literature, and of course, music — somehow inform each other in ways both expected and unexpected. All combined, they make her a fascinating person. At the end of every tour, the feeling is the same for me – a sense of accomplishment mixed with a dose of sadness that’s it over. Some artists say they are going to retire, and they mean it. Sinatra said it about every four years. Cher has been on her farewell tour for more than a decade! Marty says some artists sell steak and some sell sizzle. Steak is real and sizzle is just artifice…razzmatazz. Barbra sells the steak. He always has such a succinct way of putting things… you know exactly what he means! When you see Barbra on stage, her talent appears so effortless that it belies the amount of physical and mental energy she exerts to be the best version of herself she can be. She wants to give her audience everything she imagines they expect of her and more. On top of that, she expects more of herself than anyone I’ve ever worked with. Unlike so many contemporary stars who “enhance” their given talent with smoke and mirrors, laser lights, dancers, hyper-choreography, cranes and trapeze ropes to suspend themselves over the arena while they’re singing, she uses zero special effects or pre-taped vocals. Barbra built her house on her natural voice and her acting abilities. She also provides sterling guidance, leadership and vision. Let us not forget that she is a great director and sees the entire spectrum. So, the whole presentation is carried on her diminutive shoulders, and that’s an enormous responsibility. In addition, putting a concert tour together is a fully immersive experience, and she has so many outside interests tugging at her sleeve all the time. One small example on this tour: One afternoon I was sitting with Barbra in her hotel suite in New York, when Renata quietly escorted a young woman into the living room who was gingerly carrying a felt bag. We were right in the middle of some deep breakthrough conversation. Barbra looked up and politely asked, “Oh, can you just leave it over there? I’ll look at it later…would that be OK?” The woman explained she really couldn’t leave it, because she had to return whatever she was carrying as soon as possible. Barbra looked at me and said, “Well, I guess we can stop for a second, right?” She turned her attention to the woman, who by now had donned some white cotton gloves as she carefully withdrew a Van Gogh oil painting from the felt bag! It was about to go on auction and she wanted Barbra to see it. So Barbra started to evaluate the painting like a professional art curator – commenting on the brush stroke, the subject, the period, the patina, the frame, etc. It was just one of those perfect little “distractions” that made that particular day so interesting. I really don’t know if there are more shows on the horizon. What I do feel with all my heart though, and I know Marty and Richard share this sentiment, is that for the two hours Barbra stands on stage, sharing the songs and stories of her incredible life, no matter how time consuming it was to create the show, if she’s liking the sound of her voice — meaning if she’s generating a sound that satisfies her discerning ear — then I believe she’s actually enjoying herself…no doubt about it…and on some level, she believes she should keep going. Now, maybe I know something else…maybe I don’t…but I’m not saying either way… so, as always dear readers…stay tuned! P.S. Thanks to Richard Jay-Alexander and Todd Sussman for editorial clean-up…Marty’s personal assistant Tracy Quinn for all she does to keep the boat afloat… and once again to RJA for his photos!